Innovative new design changes the look of this popular catamaran brand. World Cat’s first X-design catamaran, the 280CC-X, features aggressive new styling that includes a graceful sheer line terminating in a soft tumblehome aft, a swept-back glass dashboard at the console, and a surfboard-edge hardtop. 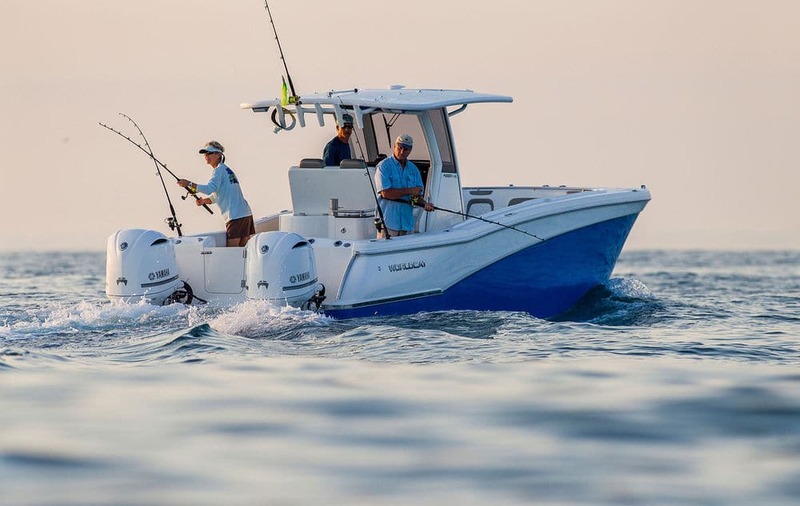 The cockpit offers twin, lockable 89-gallon fish boxes with diaphragm pumps and rod storage, twin in-floor mechanical rooms with easy bilge access, aft fold-down seating and a transom door. A fiberglass leaning post/tackle center comes standard on the 280 and includes a 30-gallon livewell. The boat’s standard hardtop features a powder-coated frame with a built-in glass windshield, radio box, spreader lights and color-changing LEDs. Available with up to 400 hp (twin 200s), the 280CC-X carries 220 gallons of fuel. World Cat’s preliminary testing showed a top speed of 48 mph, achieving 1.2 mpg. The new boat is available with up to 400 hp and can reach a top speed of almost 50 mph.